Since most entries require a web request to get the relevant data, there is always some loading time. Depending on your bluetooth connection to your phone and your phone’s network connection, this can take a few seconds. To make it visible, that the app is working and processing your request, I added a loading screen when making a web request. I added a new menu entry: watchlist. At the moment the menu only shows the episodes on your watchlist. I’m planing to add shows and to mark them as watched. I would love to hear some user feedback and your feature requests. Dieser Beitrag wurde am 10. Januar 2017 von pat in Allgemein, Development veröffentlicht. Schlagworte: lang:en, pebble, pebblejs, traktwatch. 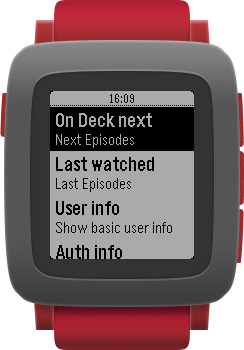 I got my Pebble 2 a few weeks ago and decided to tinker a little bit with the SDK. 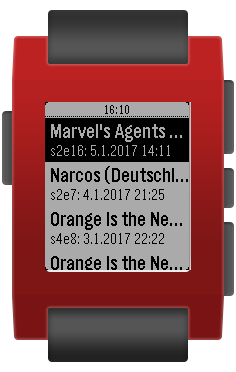 Since I’m using trakt.tv to track my tv shows and wanted to try a few things, I build a watchapp for my pebble and released it today. Maybe I will add some more features in the future. You can find more info about the app here: https://qstracker.com/traktwatch/. You’re welcome to try the watchapp and leave some comment. The process of build the app and all other things needed to operate this (oauth handler etc) was quite fun and I’m thinking about porting this for some other APIs. Dieser Beitrag wurde am 6. Januar 2017 von pat in Allgemein, Development veröffentlicht. Schlagworte: lang:en, pebble, pebblejs, traktwatch.